Hello, and welcome back! In our last blog post, we began discussing some of the top reasons why people fear audits from the IRS and common myths folk have about what the IRS does to people who need an audit. Today, we are going to continue discussing these myths. Read on to learn more, and contact Tax Law Offices today for IRS tax attorney assistance if you find yourself facing an audit. Myth: Those with lower or moderate incomes will not be audited. The IRS has increased the number of audits they perform annually. This means that no one should think they can make false claims, even if they do make smaller amounts of money. The IRS is now performing audits for all income levels, not just those at the very top. Does that mean you will be audited, even if you aren’t making a ton of money? Not necessarily. While the IRS has increased their scope for audits, only a small percentage of taxpayers get audited annually. Myth: Filing for deductions or credits will increase your chances of an audit. Some people avoid taking tax credits and deductions that they are entitled to because they are concerned that these will make them more susceptible to an audit. For some, that means not claiming a child because they live with their ex. For others, they wouldn’t claim education credits out of fear. This also includes home office deductions. However, what you need to keep in mind is there is no automatic trigger for an audit. It is only when the IRS sees the entire picture and it doesn’t add up that they will look into an audit. Myth: The IRS conducts audits immediately. The IRS follows the statute of limitations of three years after the due date of the tax return. However, for sizable issues, the IRS may go back about six years and they request that you keep your records for that long. Many experts agree that, if you are going to be audited, it’s typically going to be at the end of that three year period. Two years is generally how long it takes to receive notice of an audit. Keep in mind that there are hundreds of millions of people who live in the country and file tax returns, and that doesn’t even include businesses. It takes a long time for everything to be sorted and looked through. 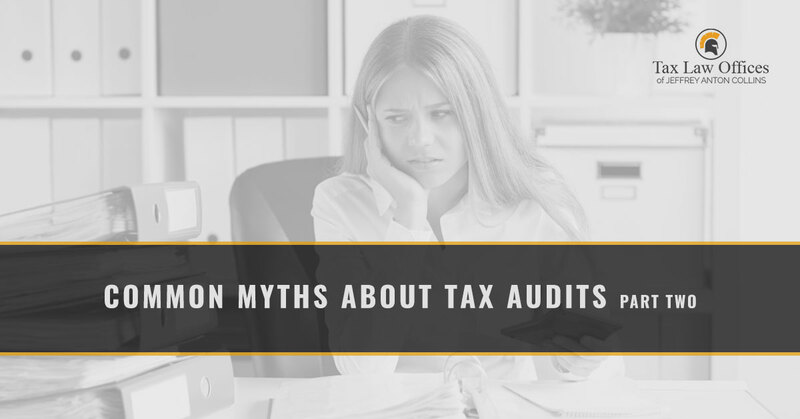 While these are some of the most popular myths around tax audits, there are certainly other ones around that can make taxpayers nervous. But at the end of the day, your tax return is you stating what you deserve to get back. An audit is the IRS’s way of saying, “Show us how you got those numbers.” However, it’s always better to feel safe when facing an audit. If you are in need of legal representation as you face an audit, contact the IRS tax attorneys at Tax Law Offices today. We look forward to working with you and learning more about your situation!